Thousands of public relations, advertising and marketing people gathered this week in and around Times Square for New York’s Advertising Week. They came to hear a wide range of speakers and panel guests share their insight and opinions on the current and future state of the advertising business. 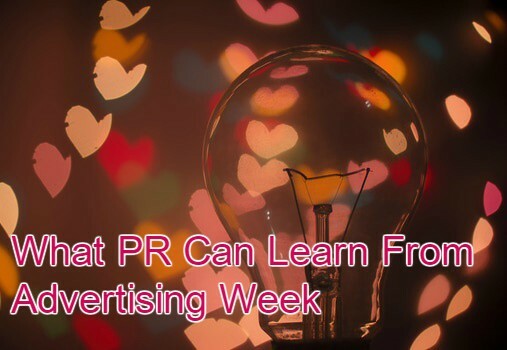 As the lines between PR and advertising have blurred, the discussions during Advertising Week are increasingly relevant to public relations professionals. Here are some of the hottest topics covered by the most in-demand speakers. What are the PR ramifications here? We see the same overarching themes resonating in public relations: ever-evolving content needs, customer-driven communication and the undeniable importance of digital media. We particularly recognize the importance of Nigel Morris’ statement that “everything you touch through digital creates data.” PR teams that have become sophisticated in their use of data gleaned from digital work recognize its power for helping shape a company or brand image and drive media interest. The more attention PR can pay to audiences – and create compelling content for them – the better positioned we are as an industry for the changes that keep coming our way in a digital universe.